Easter has historically been a gorgeous, sun-drenched day in the city for me, but this year was... well, not that. However, overcast skies, blustery winds and the threat of rain didn't keep me from punching up all that grey with a (big, billowy) dose of pink. As for the fashunz, I'm getting really frustrated with my winter wardrobe, so I decided to shelve it for the day. I busted out a favorite maxi skirt from last season and this sweet little F21 blouse I picked up a few months ago. Together the combination is breezy and summery - but with booties, a scarf and my most treasured-and-tough Schott jacket, I still feel grounded and seasonally appropriate. A few of us attended Catholic mass at Old Saint Patrick's Church on Mott and Prince -- one of the oldest churches in the city. I'm not Catholic myself, but I attended Catholic school my whole life, and so feel comforted, relaxed and at peace in church every once-and-a-while, so it's a nice reprieve from the city. 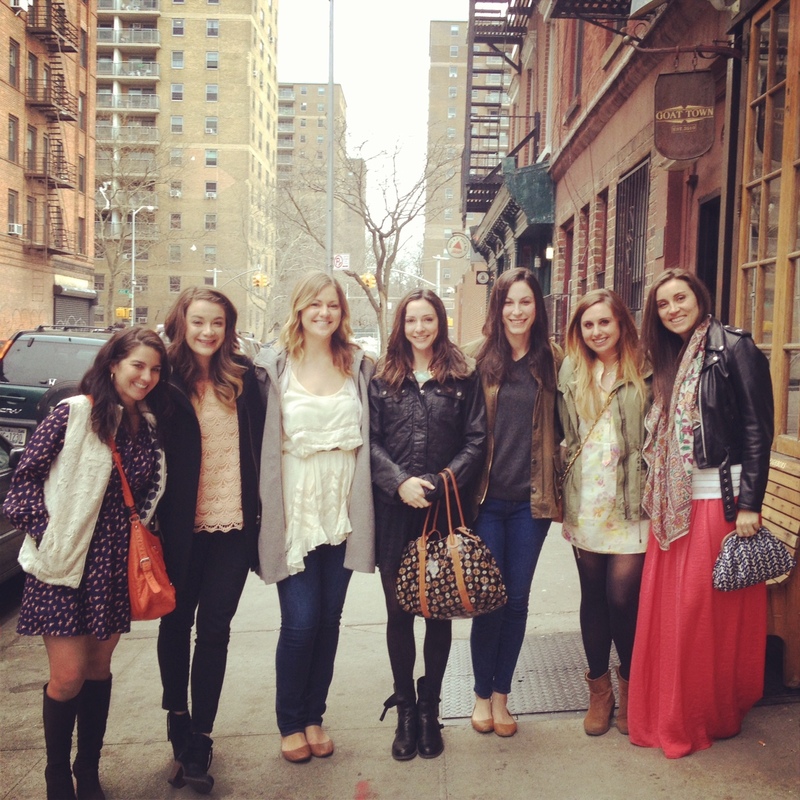 After, Sammi, Steph, Tully and I grabbed coffees down the block (Gimme! Coffee) and then headed back uptown for a big, indulgent, savory brunch at one of my new favorite neighborhood spots, Goat Town. We were joined by Rach, Sue and Amanda and whiled away the rest of the afternoon with bloody mary's, kale salads, biscuits and eggs. Great day, great friends, great food. Whether you celebrate Easter, Passover or just Sundays in general, I hope you all had a fabulous weekend. All the details: Schott NYC jacket / Forever 21 blouse / Mango skirt (old, similar) / DV by Dolce Vita booties / vintage scarf / Lulu Frost necklace (gift) / Ugg Australia bag (c/o) / Ray-Ban shades. 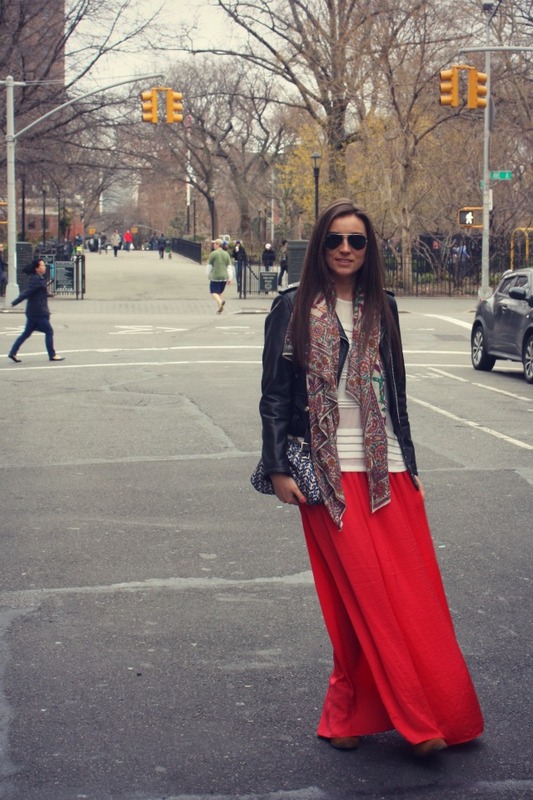 Maxi skirts are my fave for every season! Cannot wait to wip out of pink maxi skirt! I am just in awe! Perfect look for the perfect East Village! Just beautiful! 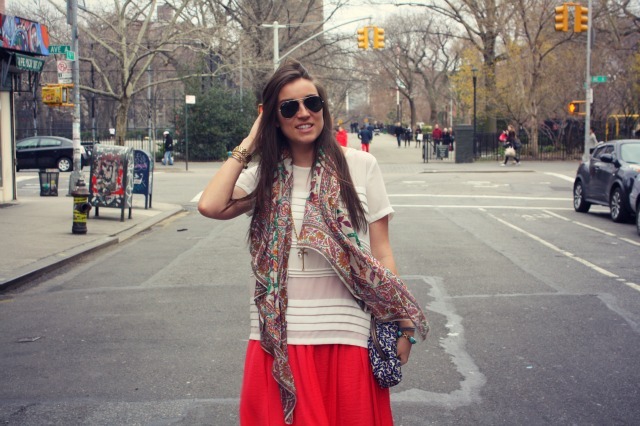 I love a maxi skirt this time of year and this is a really beautiful, eye-catching choice. Love it! What a great look for the holiday weekend! Love your scarf and bracelet. Looks like a fun time! Love your Lulu Frost necklace!!! I just got the Plaza "K" necklace and I am in love with it. Lulu Frost's jewelry is so amazing! Love your look! Your clutch is so super cute! It's Ugg?? ! !